The Reynolds wrestlers made a run in the middleweights, but it came too late to catch Corvallis during a 37-25 loss to Corvallis in the third-place bout at the Raiders' Kirk Morey tournament Friday. The Raiders got onto the scoreboard halfway through the dual when Allen Jacinto needed less than a minute to flatten his opponent at 152 pounds. Teammate Burgess Myers earned a forfeit in the next bout, and Dade Kimmel scored an early takedown and near-fall on his way to an 8-6 decision at 170 pounds. Reynolds made it four straight when Joseph Mercado stepped onto the mat to the enthusiastic support of his football teammates, who came out of the bleachers to cheer him mat side. "It's always a good feeling when you know people have your back," said Mercado, who plays on the offensive and defensive line in football. He responded to the cheers with a series of takedowns in the first period, completing one of them at the edge of the circle, then surviving a tumble and taking out his opponent's legs for another two points. Mercado scored a quick escape to start the second period, and the clock went to zeroes with him closing in on a cradle hold in the center circle. Mercado finished with a 13-4 major decision that brought the Raiders within 25-19 in the team score. "Every opponent gives you something different," Mercado said. "By the second round, I could tell he was tired, and I kept pressuring him." 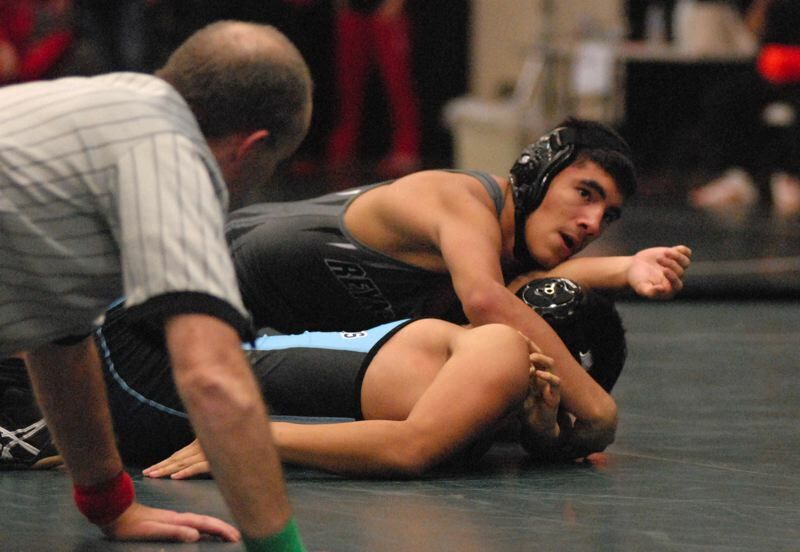 Unfortunately, the Raiders were not able to send a wrestler to the mat at 195 pounds, and the forfeit ensured Corvallis would win the third-place dual. Wyatt Leonard scored a pin for the Raiders in the heavyweight bout. Reynolds opened the tournament with a 48-30 win over West Salem before falling 48-33 to Estacada in the semifinals. Reynolds saw Jacinto (152), Myers (160), Kimmel (170) and Mercado (182) all go unbeaten across the team's three duals, combining for eight pins. Jacinto finished off each of his opponents in the first period, spending only 3 minutes, 20 seconds on the mat. Tualatin and Estacada split bouts in the championship dual, but the Timberwolves built an edge in pins to claim the 42-36 victory.